For our customers’ various events such as weddings, receptions, birthdays, seminars and others, we are known to render optimum solutions for Event Photography. Our provided service is executed in close proximity with customers’ requirement at par with industry defined guidelines. Use of advanced cameras and photography techniques is made while executing this service. Budget for one session with 45 page (5 Rolls) non tearable, synthetic, water proof, industries big size 12 inch X 36 Inch album from 8000/= onwards including Unlimited number of Raw Photos, High Resolution Raw Photos DVD, Professional Still Camera, Professional Camera Man, High Quality Photoshop Photo Editing, Printing, Binding, Acrylic Special Pad Wrapper along with 6 Page 12 inch X 18 inch year Calendar with Couples Creative Pictures as compliment. 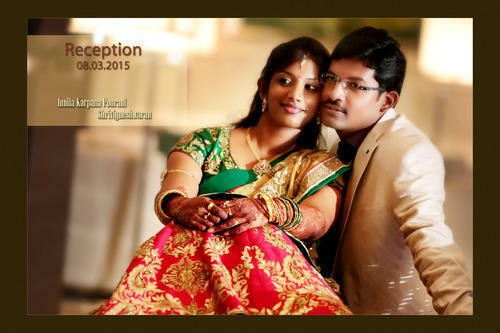 VJS Mangal Wedding Moments was established in the year 1962. Our company is a prominent service provider of qualitative services that are a perfect match for all wedding related needs. Our company is instrumental in its business domain since its establishment as a Sole Proprietorship based entity with its business unit established at Chennai, Tamil Nadu (India). We are known to render cost effective solutions for Photography Service, Wedding Service, Decoration Service, Show Service and many others. Moreover, our experts work with full dedication and close synchronization to finish these services according to necessity of our valuable customers. In order to provide reliable services to our honored patrons, we are backed with knowledgeable team. Our team is well-known in the market owing to their ethical behavior and prosperous knowledge skill. Our experts execute these services within predetermined time frame. We are looking for inquiries from Chennai and nearby areas only.